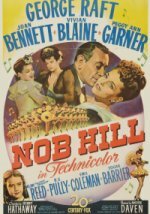 Nob Hill is where the nobs used to live in San Francisco, an area now the preserve of the city's swishest hotels. But this brash Fox musical is pretty downmarket, starring George Raft as the saloon owner who jilts torch singer Vivian Blaine for socialite Joan Bennett. The songs are strictly B-sides and Henry Hathaway's direction doesn't have the necessary light touch. Another drawback is Raft, never a convincing leading man, though he once laid claim to being the world's fastest Charleston dancer. In turn-of-the-century San Francisco a saloon bar owner finds himself attracted to a volatile socialite despite their different backgrounds.